...I just like the noise they make playing it. Could you point out where it sounds dirty? Apart from Hoo doo blues, maybe, but the rest? Here are a few. Not exactly a sonical clarity fest, from the vocals to the guitars and the drums. Put on some Stevie Ray Vaughn afterwards and you'll get my drift. Edited 1 time(s). Last edit at 2018-11-09 12:47 by DandelionPowderman. Edited 1 time(s). Last edit at 2018-11-09 13:02 by snoopy2. Yeah, compared to Stevie Ray Vaugh (or Eric Clapton or Robert Cray) I agree. I guess we think differently about what's dirty or not, but that's alright. Edited 1 time(s). Last edit at 2018-11-09 13:45 by matxil. OMG Rambler was the dirtiest its possible to be in this realm of consciousness, spine chillingly euphoric. You've never heard MR from Brussels 1973 before, Riffie? Well i had it on an old bootleg years ago on tape, and the sound was terrible, so i've never heard it like that before. I'm not one for playing old bootlegs , i hate crap sound. Listening to Rambler again there, brings to mind that Taylor got the best out of Keith, he reached far greater heights with Taylor, he got a bit lazy with the rhythm with Ronnie. Keith was best leaving the soloing to Taylor and concentrating on the rhythm. Just hearing that made me realise how watered down the Stones have become with the Chucks and Clifford's, plus Jagger was so much more potent when he just hovered around the mic stand and the band with his Jagger moves as opposed to going for a walk jog these days. Edited 1 time(s). Last edit at 2018-11-09 14:33 by keithsman. I'm aware of all that thanks, i just play my records , i'm happy with that. Edited 1 time(s). Last edit at 2018-11-09 14:31 by keithsman. Or just drop a new song or two like the younger artists do. Working up some of the good in the vault music, would be great too. Why the comma? I don't know. Channeled "Paint It, Black", I guess. Sorry about that. Blue and Lonesome is superb, Crosseyed Heart is one of my all-time favourite albums, I must say. Blue and Lonesome is a collection of covers, most of which are not better than the originals (nor worse). Nice to listen to during a diner party, or while practicing some blues guitar, but hardly the best thing that ever happened to rock music. They have been able to play the blues ever since they started, the album might just has well come out in the 80s or 90s. Crosseyed Heart is a very good album, but more than anything else it shows that if Keith would have chosen to really dedicate himself to a solo career, he might have grown out to achieve some artistical reputation on a par with Tom Waits, Leonard Cohen or Nick Cave. Neither album means anything with relation to any upcoming Stones LP or EP. In the late 80's, Keith came out with Talk Is Cheap, which was also a very promising album but it didn't in any way whatsoever have a positive influence on the Stones output. 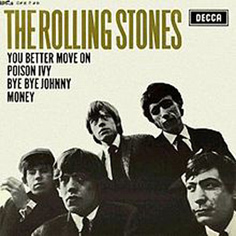 Okay, maybe on the Keith songs on the Stones albums, giving him more confidence developing his own style, but overall the Stones albums since Talk Is Cheap have been just mediocre, with an occasional highlight on Bridges to Babylon. Actually, if they bring out an EP, I would be more hopeful. Maybe 4 great songs they all really believe in is still possible. But I doubt it will connect to anything else going on the musical world, so the impact will be small. Never mind though, it's not completely impossible some of it might be enjoyable. That's where our opinions differ. I like the sounds the Stones are making. It's the same songs, of course, but the Stones sound like... um, the Stones - hence the songs sound like the Stones, too. When I hear Mick sing, and the boys playing, there's something extra there. For me, B&L does NOT sound like some band going through the motions, cakewalking through numbers they can play in their sleep - far from it. Fully agreed Dandelion !! !I think n feel the same. Its one of my fave Stones albums. Dirty n with a Swagger. B&L is great for that reason -IMO, of course-: no pretensions at all, just cool and fun music. You can even hear Keith going to a wrong chord on Just Yor Fool. I do think Keith's (and Ronnie's) rocking solo albums led to Voodoo Lounge era, which was way different to "the Flashpoint years". Talk Is Cheap and Slide on Live are simple, yet raw and fun albums. And that's what I want from them: just plain rock and roll. No ballads, no love songs, no modern trends, no sonic revolution, no rebelliousnes. Within the super narrow boundaries of plain rock and roll you can find anything. Despite many things I got to hate from these guys, I'm expecting a really great album. In the Stones I trust. Yes love the guitars on BL - I always thought the dirty sounding guitars on Dirty Work were some of the best studio guitar work Keith and Ron did. DW is a great sounding guitar record just tune out the lyrcis. Over the years I got to appreciate at least the overall sound of the guitars on Dirty Work. I'm sure a lot of people on this site would like a return to the days when it was just the five musicians on stage. When I saw Brian Wilson recently..it was Brian plus around 11 musicians. All very Beach Boys sounding but the rationale for 11? That's double the original group. Fleetwood Mac same. There must be some of the Legacy Acts out there who have not gone down the same road. Will we have IORR-correspondents out in Paris for updates on the Stones's studio sessions? Agree with you regarding Blue and Lonseome matxill- not really bad, but not really great either...just the Stones doing blues covers which they cranked out in two (or three?) days. Overall the band sound great together, and for the most part Mick's singing was great on it, but for me personally the tunes aren't truly elevated in the same way that some of their other past covers have been - Love in Vain, Stop Breaking Down, Just My Imagination, etc. - all which were truly put through the Stones machine and regurgitated to differentiate themselves from the originals. These blues covers are simply regurgitations without much thought put into them - how could there be when they were recorded spur of the moment? Nothing really wrong with them, but nothing exceptionally great either IMO. As for the thought of an EP and/or releasing singles leading up to the a full new album...the more I ponder this, the less I like the idea. With the exception of Blue and Lonesome where they did release the best tracks as singles prior to release, seems every other single they've released on proper albums in the latter era have not been the best of the batch imo. The first single from ABB was Streets of Love/Rough Justice. While one might agree that RJ was a decent pick, why would the choose SOL to represent the new album? Then look at Bridges and the first single being Anybody Seen My Baby...far from the best on that album. Love is Strong is an alright pick from Voodoo Lounge, but then Mixed Emotions for Steel Wheels...not really a great album by any means, and it probably didn't make a difference which one was first single. Then for Dirty Work they released a cover tune as the first single, and while I like their take on Harlem Shuffle, odd that they would choose a cover tune (especially when the original is better imo). So fast forward back to today...how and who decides on what is the "best" track to be released as a single? Mick and/or Keith? Universal? Does Chuck have a vote? Don Was? Maybe a combo of all of them? Or maybe none of that will apply if they haven't completed a full album. If thats the case, maybe they will release songs that have been completed (ala Don't Stop, Doom and Gloom, et al), while testing the waters before finishing other tunes. If the album is absolutely complete, I hope whoever picks the first singles think hard about it, and if they release singles in the order of completeion, hopefully they finished the best ones first. Imagine after all this time they release Streets of Love pt. II as the first single? Edited 2 time(s). Last edit at 2018-11-09 19:19 by Hairball. Looking (on Wiki) at the groups chart 'success' regarding Singles since 1994, its a wonder why they/the record company bother to release them at all. Would they sell any more than Mick's much derided recent solo effort? Would they really make any difference to the album's commercial success? Gets some air play and interest I guess, must be marginal though. Just think of a stones live show without the war horses the possibilities are endless, they would of course have to up their game and take chances. When I saw Brian Wilson recently..it was Brian plus around 11 musicians. All very Beach Boys sounding but the rationale for 11? That's double the original group. Although not necessary for the early stuff, the rationale for 11 is for replicating the Pet Sounds-era tunes where the Wrecking Crew was involved...obviously well beyond five-piece. Songs from Pet Sounds, Smile and things like "The Little Girl I Once Knew" sound incredible on stage with the same instrumentation (horns, keys, etc.) used in the original recordings. I'm with you here on this. Agreed. Here's another way to look at it: think of all the GOOD and REALLY GOOD songs they've not played and don't play. Hence no songs anymore since 1989-90 from their worst LP. Please Mick, no more bluesy crapola. Um this seems to be the problem, Mick has other ideas, maybe he doesn't want to make a traditional Stones album, this could be why the album has taken so long, he either struggles to come up with Stones material ( suitable material for a Stones album ) or he is just tired of that genre. I don't think even he knows what music he want's to make anymore, hence the creative drought. Waiting for someone now to jump in and demand the album TODAY!!!! And it better be GREAT!!! To be honest, I've been waiting for this album for so long that a wait of 8 months or less feels like it's coming next week! That could be the theme of the tour. The No Warhorses Tour. Small venues. Just for, you know, folks like us.